So Marx started off by examining the commodity, and the commodity relation as the social relation between commodity owners. He examined money as a developed form of value, that emerged out of exchange, and then introduced the concept of capital, self-expanding value. Starting from the relation between capitalist and labourer as an exchange relation between commodity owners, Marx moved behind this relation to the sphere of production in which the capitalist set the labourer to work. He then analysed in detail the production of SV in the immediate process of production, where the relation between labourer and capitalist is no longer a relation of equality between commodity owners, but an exploitative relation in which capital seeks to maximise the SV it appropriates. Marx distinguishes the labour process from the valorisation process and argued that capitalist production is a combination of the two in which it is valorisation that is in command. He then went on to examine absolute SV and the means of producing absolute SV by lengthening the working day. He then turned to relative SV and the means of producing this by revolutionising the means of production. This led him to examine in great detail the way in which capitalist control of the process of production transforms production as both a social and a technical process in the search for relative SV. Finally Marx has a digression on wages, arguing wages are the form of appearance of the price of labour power in which it appears that all labour is paid for. It is thus a form of fetishism. So far the analysis of the production of SV has looked simply at one production period. However, once SV has been produced and incorporated into the original capital, the new enlarged capital is laid out again. Thus capitalist production has a fundamental dynamic, the dynamic of accumulation, in which the scale of capitalist production constantly expands. It is the dynamic of accumulation that governs the development of capitalist society, for it is not simply a quantitative expansion. The increasing scale of accumulation also produces qualitative changes. 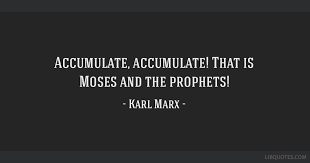 The concept of capital accumulation is therefore central to Marx’s understanding of historical development, of the ‘laws of motion’ of capitalist society. Marx defines the circulation of capital in which capital passes through its various forms: money is transformed into means of production and labour-power in circulation. Means of production and labour-power are converted into products, that embody the original capital plus the SV, in production. The products are then sold in circulation, with the aim of realising the original capital plus SV in order to throw the augmented capital back into the fray by buying more means of production and labour-power. For the moment Marx simplifies the analysis of accumulation by making two fundamental assumptions. Firstly, he abstracts from the sphere of circulation altogether and assumes that all commodities are sold without any difficulty at their value. (It is relaxed in Volume II). Secondly, Marx assumes that there are only capitalists and workers, ignoring the different forms of capital – ignoring rent, interest, money and the credit system. (This assumption is relaxed in Volume III). The fact that in the analysis of Volumes I and II Marx does not consider the division of SV between different capitalists, but only considers the division of SV between different capital and labour, is very important. Marx, for the bulk of his analysis, ignores the fact that there are many capitals, each independent of the others, to conduct the analysis at the level of capital-in-general. Beware those who try to apply the analysis of Volume I directly to the real world. If the SV that “acquires the form of a revenue arising out of capital” (p. 712) is consumed by the capitalist, then the capital laid out in the next period will be unchanged. (we are dealing with simple reproduction, where there is no change in scale because SV is consumed rather than invested). It becomes clear that the worker is paid a portion of his own product, although this transaction “is veiled by the commodity-form of the product and the money-form of the commodity”. It is only when the process is seen within the context of reproduction that this becomes clear, and the idea that VC is advanced by the capitalist disappears. Even if the capitalist advanced the VC in the first place, it is not long before the capitalist has consumed all his original capital, so that all that is left is capitalised SV. When we look at the reproduction of the system as a whole even the individual consumption of the worker becomes a part of the reproduction of the whole, since it is the reproduction of labour-power. Since in his consumption the worker consumes his means of subsistence, he has to return again to the labour market as wage labour. Thus the worker is as much an “appendage of capital” as is the machine, his independence being an independence of any particular capitalist, but not of the capitalist class as a whole. The accumulation of capital implies that the means of production and means of subsistence that are to be purchased by the reinvested SV have in fact been produced (Marx examines this in more detail through his ‘reproduction schemes’ in volume II). The working class is employed by capital that is the product of its own surplus labour. Marx is argues that it is only as a class that the exploitation of labour by capital appears and that classes cannot be conceptualised on the basis of commodity exchange. The political economists wrongly believed that all SV is converted into labour-power. Marx explained that the additional capital has to be laid out to buy both labour-power and means of production if it is to enter the accumulation process. Marx then goes on to look at the development of the concept of capitalists’ saving and consumption. In the early stages of accumulation the capitalist was compelled to be miserly and abstentious, and political economy contrasted him with the wanton and idle aristocrat who wasted capital in consumption, thus all consumption by the capitalist was seen as a betrayal of his capitalist duty. Later, as accumulation progresses, it becomes possible and even necessary, for capitalist consumption to increase. As the capitalist came to be confronted, from 1848, by the working class, rather than the landowner, vulgar economics came to replace political economy. Suddenly, instead of accumulation being considered the sacred duty of the capitalist, of abstinence from consumption, so that profit comes to be seen as the reward for his self-denial. To criticise this view Marx simply points out that reproduction on an increasing scale is characteristic in the economic formations of many kinds of society without those societies having capital: abstinence is a universal feature of expanded reproduction, while capital is a particular economic category and social relation. Given the rate at which capitalists consume out of SV, the rate of accumulation will depend on the magnitude of SV, and so on the factors that determine that magnitude. Marx discusses such factors as forcing wages below the value of labour-power, increasing the duration and/or intensity of labour and increasing the productivity of labour. An increase in the productivity of labour means that the same quantity of goods cost less. Thus the capitalist can maintain the same standard of living while increasing the amount of SV thrown back into production. In the same way a given magnitude of capital can employ more labourers and more means of production and so both the physical and the value rate of accumulation increases. Marx then criticises the labour-fund theory, that argued that there was only a fixed fund available to supply the workers, so that the total wage bill was invariable. Hence if one worker had a pay increase, others would either have their pay reduced or lose their jobs. This theory presupposes both that the supply of wage-goods is fixed (and that workers cannot encroach on capitalists’ consumption) and that a given number of workers provide a given amount of labour. It is a theory that persists today. Marx introduces the concept of the composition of capital. The value composition of capital is the proportion in which the capital is divided between constant and variable capital. The technical composition of capital refers to the physical relationship between means of production and labour in the process of production. This definition is not altogether clear. It seems that what Marx is saying is that the organic composition is the same thing as the value composition if we abstract from changes in the value of labour power or of means of production: it is the ratio of means of production to labour-power valued at constant prices, and so abstracting from changes in the productivity of labour in the production of means of production or of labour power. With a given organic composition of capital, accumulation of capital implies an increase in the number of workers. Eventually such an increase may outstrip the supply of labour-power, so that wages rise. If the price of labour rises enough to reduce the rate of accumulation, then the demand for labour falls and the pressure on wages is reduced. Hence the rate of accumulation is not determined by the supply of labour, rather it is fluctuations in the rate of accumulation that determine the amount of exploitable labour-power. He argues it is accumulation that determines the growth of employment. Marx then considers changes in the organic composition of capital. Accumulation is associated with a steadily increasing productivity of labour, and this in turn implies a steady increase in the technical composition of capital: as a consequence of increasing productivity each worker turns more raw materials into products; while correspondingly the introduction of more massive machinery, etc to assist the worker is a cause of increasing productivity. Marx then argues that this change in the technical composition of capital is reflected in an increase in the value composition as the proportion of capital laid out as constant capital steadily increases. (Note, this in fact assumes that the prices of means of production do not fall (as a result of increases in productivity) faster than their volume increases). The process of accumulation is a process of the expansion of capitalist production and an increase in its scale. This involves both the increasing concentration of the means of production in the hands of ever larger capitalists, and the appearance of new capitalists in competition with one another. Apart from this concentration of capital that is a result of accumulation, there is also a centralisation of capital as more profitable capitals swallow up less profitable ones. The rising organic composition of capital means fewer and fewer workers are employed by a given size of capital, and correspondingly the renewal of old capital tends to displace workers. Marx argues that the rising organic composition of capital means that a larger capital is required to maintain a given level of employment. Thus accumulation must become progressively more rapid to maintain employment. At the same time, though, the rapid accumulation means a more rapid increase in the organic composition. Thus accumulation itself produces a “relatively redundant working population” (i.e. creates unemployment): this is the relative surplus population. Because of the unevenness of capitalist development this relative surplus population is constantly being created in some branches of production, and is often reabsorbed in others, and this is on an ever-increasing scale. This surplus population is a “condition for the existence of the capitalist mode of production” as the industrial reserve army that provides a mass of available labour power independent of the natural growth of population, and permits accumulation to proceed unevenly. The industrial reserve army also, by its competition,, forces the employed workers to submit to intensified labour, so further reducing employment. Finally, it is the expansion and contraction of the industrial reserve army that “exclusively” regulates the general movement of wages (p. 790). Thus the supply and demand for labour are not independent of one another, but both are aspects of the accumulation of capital: accumulation both employs workers and throws them onto the labour market and “the mechanism of capitalist production takes care that the absolute increase of capital is not accompanied by a corresponding rise in the general demand of labour” (p.793), (i.e. if accumulation exhausts the reserve army and wages rise, then this gives a stimulus to increasing the organic composition of capital that displaces workers so that wages fall back). Marx then looks at the relative surplus population in more depth. Marx sees the constant growth of the reserve army and of pauperism as the counterpart to the process of capital accumulation. “This is the absolute general law of capitalist accumulation” (p. 798), although Marx adds, “Like all other laws, it is modified in its working by many circumstances”. Under capitalism accumulation is not for the benefit of the worker but is the means by which his or her position is steadily worsened. The final section illustrates the “general law of capitalist accumulation” by providing a succession of examples of the growth of poverty and unemployment in the midst of rapid accumulation, concentration and centralisation of capital. Note on p. 822, Marx refers to the best-paid section of the working class as its “aristocracy”. Part Seven ties together his earlier analysis by relating the parts of the system together into an interdependent and dynamic whole. Thus, for example, the separation of the labourer from the means of production and subsistence, on the one hand, and the confrontation of this labourer with money capital, on the other, were initially seen as being separate preconditions of capitalist production. The analysis of accumulation ties these together and shows how capitalist production creates not only use-values, not only values, but also capitalist social relations: capital and wage labour are both products of accumulation of capital. In the same way the growth of the labour force or of the market are not factors external to capitalist production, but are themselves aspects of the accumulation process.